The Alumni Office will hold a mass swearing-in ceremony for the July 2018 Georgia Bar Exam passers and any other Atlanta’s John Marshall Law School (AJMLS) alumni who would like to be sworn into the Supreme Court of Georgia. We will be honored by Justice Carol Hunstein of the Georgia Supreme Court and Judge T. Jackson Bedford of the Fulton County Superior Court. The ceremony will be held at 6:30 p.m. on Thursday, November 29, 2018 at the G. Alan Blackburn Conference Center. Please plan to arrive no later than 5:45 p.m. to arrange the necessary paperwork. After the ceremony there will be a reception with light hors d’oeuvres. Alumni are welcome to invite their friends and family. If you plan to attend please R.S.V.P. by reserving tickets here by Monday, November 26th. 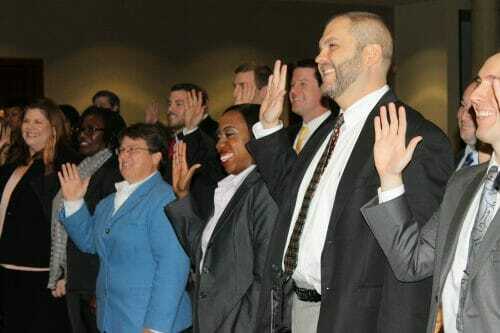 In order to be sworn-in to any or all of the courts, you must have ALL paperwork to the Alumni Office no later than Friday, November 16, 2018 by 5:00 p.m.
Superior Court Admission – For admission to the Superior Court, the Alumni Office will need the Original Certificate you receive from the Georgia Bar Admissions. There is no fee or other paperwork associated with this court admission. Georgia Supreme Court Admission – For the attorney admission form for the Supreme Court, please visit: http://www.gasupreme.us/court-information/attorney-admissions/ and complete the application (leave the Bar Number blank if you don’t have one). Very important – AJMLS will provide the sponsoring attorneys so please leave that portion blank. We must have the original, signed application to give to the court so please either deliver it by hand to the law school or mail it to the law school so we receive it by November 16th. The cost to be sworn into the Georgia Supreme Court is $30.00 and must be paid through the Supreme Court Purchase page. Please attach a copy of your PayPal receipt with your signed application. Parking will be available in the AJMLS parking deck and other local decks. Please do not park at the Blackburn Center as that will be reserved for the judges and clerks. For more information, please contact the Alumni Office at (678) 916-2603 or by email to emurray@johnmarshall.edu.